"Following the path that made The Empire Strikes Back and The Wrath of Khan such great films, Ruggiero dishes out defeat after defeat to our heroes for most of the book. The villainous Copolla is dead, the heroic Greg Carlson's consciousness has been separated from his body and trapped in another dimension, and Sarah Carlson has given birth to two very special children. It turns out that Copolla (like all good villains) isn't entirely dead; his mental energies return to Earth, take control of the President of the United States and he hatches a scheme to upset the plans of the United Council for Developing Worlds for bringing Earth into their federation. Actors often claim that villains are more interesting to play, well, it's just as much fun to watch them succeed on occasion. 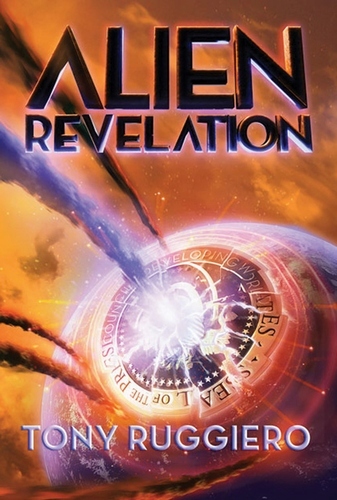 In the sequel to Alien Deception, Greg is visited by a mysterious alien who claims to have the answers that he seeks--how to save the Earth from ultimate destruction by the approaching alien fleet led by the ruthless Copolla. However, the answer provided by the mysterious alien does not come without a very high price which Greg has no choice but to pay. The long awaited test of the interstellar spacecraft, which was built with the secret assistance of the United Council for Developing Worlds is sabotaged. This in turn leads to the discovery of the council base on Earth, and also exposes the collusion of Edward Samuel, the President of the United States, with the alien organization. President Edward Samuel is charged with treason and the military has its nuclear weapons poised to strike the alien base unless they surrender. Soren, the son of Greg and Sarah, has discovered his new talent--the ability to not only influence the thoughts of another person but to change them completely. If this power, or weapon, should fall into the wrong hands, it could change the balance of control in the galaxy forever. While the leaders of Earth's countries await the decision of the alien organization, it becomes a race to see who can get to Soren first--his father whose mind is struggling to return from a galactic void, or the most feared and demented alien in the galaxy who has assumed the physical shape of someone very close to Soren.